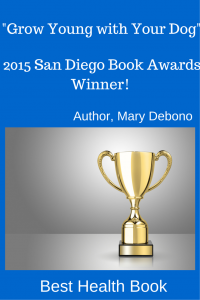 Mary’s award-winning (2015 San Diego Book Awards – Best Health Book), Amazon Best Seller, Grow Young with Your Dog, is available from Amazon in paperback and Kindle. Or you can buy the downloadable ebook here (pdf version) for the lowest price point at only $8.97. Click here for a full description of the book, including photos of the dogs whose stories are told in the book. Purchase includes access to over four hours of online audio/video instruction! It makes a great gift for yourself, your dog and your friends! 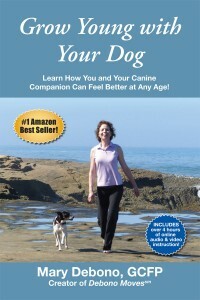 “This is a wonderful book for every dog owner, not just for their dog but for themselves too. 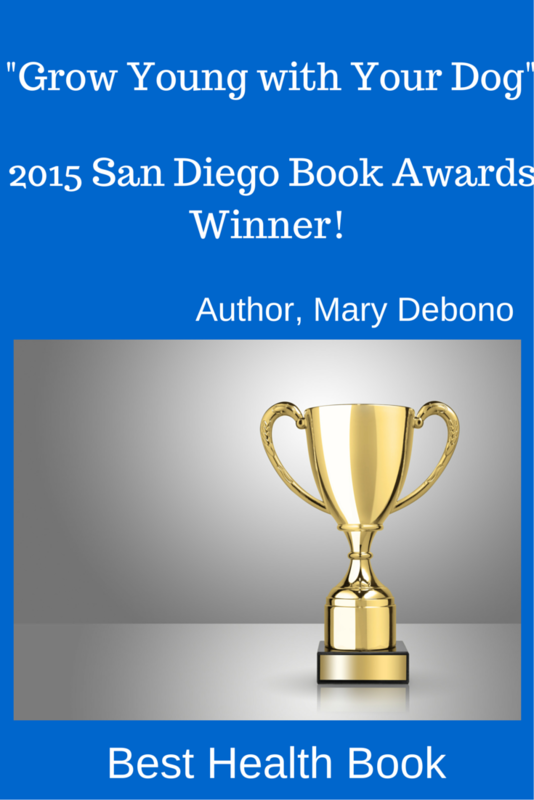 The exercises are straightforward, well-explained and mindful.” Read more reviews. 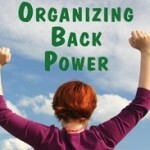 Click here to download the Organizing Back Power video. Great for equestrians! Improve your posture and riding effortlessly. This video can vastly improve your back’s power and freedom in minutes. Double the range of your Cobra pose! 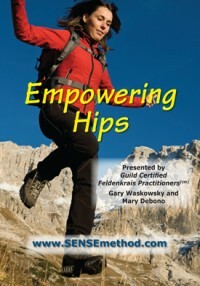 Guild Certified Feldenkrais Practitionerscm Gary Waskowsky and Mary Debono lead you through a movement lesson designed to eliminate the rounded back from constant sitting and stress. You can look and feel younger with a naturally elegant posture. Learn how to use developmental movements to improve your back’s power and flexibility easily and effortlessly! Improve your balance, coordination and athletic skills, including walking, running, riding and golfing. Imagine doubling the range of your Yoga Cobra pose. This lesson does that for many people. Please note that Organizing Back Power is not intended to treat any medical condition nor does it replace medical care. Please check with your physician before beginning any movement program. Do not do the movements if you experience pain. 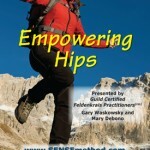 Click here to download the Empowering Hips video for only $14.95. Empowering Hips is a revolutionary way to improve the use of your hips, pelvis and lower back. Video is about 51 minutes long. Empowering Hips is especially helpful for equestrians, walkers, runners, golfers and anyone looking to improve the comfort and use of their hips, pelvis and spine. Only $14.95 for over 51 minutes of instruction! Click here to download the video. Please note that Empowering Hips is not intended to treat any medical condition nor does it replace medical care. Please check with your physician before beginning any movement program. Do not do the movements if you experience pain. Learn to release back tension and improve posture effortlessly! Certified Feldenkrais® Practitioners Gary Waskowsky and Mary Debono lead you through a relaxing, approx. 22-minute video to help you learn how to relax your back, open up your chest and stand straighter. All with gentle movements done with a 6″ Feldenkrais® foam roller, or even a rolled up blanket. The movements are designed to reduce tension and stiffness, enhance flexibility, open up chest and shoulders, and improve posture. In just minutes! Please note that Rollercise is not intended to treat any medical condition nor does it replace medical care. Please check with your physician before beginning any movement program. Do not do the movements if you experience pain.